How to Determine Best LOP for an AR9 PCC? - Pistol Caliber Carbine - Brian Enos's Forums... Maku mozo! How to Determine Best LOP for an AR9 PCC? How do you determine the best length of pull for an AR9 PCC rifle? I'm 6'3" tall with long arms, so I pulled my stock all the way out when I first built my PCC rifle... I've continued to shoot it that way without much thought... Now I'm wondering if I should go shorter or longer? I tend to run my stock shorter as it helps in snapping the gun up to shoulder and transitioning to weak shoulder for hard leans. I run a collapsible stock usually 1 click in from fully extended. I’m only 5’10”. I think it more about your stance, if you using the squared approach then the trend is shorter LOP. I like short LOP and light/short barrel for fast close work. I like my charge handle close my nose, I feel it helps me move the gun faster. What I haven't worked on is the notion of move the head and gun will follow is faster than drive the gun to next target. I found the dot bounces less if I move the stock in a little from my shoulder pocket, more centered than where I'd normally run a rifle. That necessitates me shortening the stock. My AR15 is on the 3rd notch from fully collapsed, while my PCC is on the 1st. 6ft tall, average length limbs. One notch out from fully collapsed here, too. Stock gets mounted inboard toward centerline with shoulders square to the target. 5'11" tall, running my PCC with the stock on the second hole from fully collapsed. This length feels the most natural with my Cmore scope. I'm also 6'3 with long arms. I shoot my PCC from a squared stance and my stock is on the 4th notch. For me, extending the stock beyond that made my chest/shoulders feel "tight" during transitions in steel challenge matches. Being on the 4th notch allows me to swing a little easier and the sacrifice in "stability" didn't matter because I was shooting at 10"+ plates at very short distances. When I started doing falling plate matches which involved longer shots on smaller targets, I played with extending further and found that the added stability helped my accuracy a little, but that I was slower to get on target after running from box to box. Ended up going back to the 4th notch for that as well. This is something I am wondering about, with the A5 tube I have been testing shorter positions, but I do like it stretched out. I definitely think it's personal preference. Try different lengths and see what you like and works the best. For a speed/close stage/hosing, etc. I like to run one click from fully collapsed. It shoulders faster/easier. But I find I get more dot bounce that way, so for stages with longer shots I run a little farther out and that allows me to 'pull' the gun in harder. I like my nose close to the charging handle, but not touching it. I just adjust a stock for what clothing I am wearing. This gives me a consistent LOP with whatever I am using. I usually run 5th notch from collapsed. 4th notch for tight quarters and 3rd notch should I need to switch shoulders which in case regularly becasue I am a lefty. WOW!!!!!!!!!!!!!!!!!! This guy gets it! Take it from someone who fits trap guns to trap shooters, hint........................ You can't do it online ! If you hit your target every time,( or damned near every time) if it is comfortable to shoot, and you can manipulate it safely through a course of fire, leave it the f**k alone ! 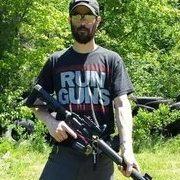 I'm only 5' 7" and I run my stock all the way out... however I like the fixed A2 stock on my 3gun rifle so that might explain things. I honestly haven't experimented much so next practice session I will give it a whirl. Over the last few years I've set up several stocks and I always end up with the easiest shouldering, easiest hard leans and fastest splits with the tightest pairs on target as well as the easiest use of barricades and improvised positions at 12.2-12.5" inch LOP. It's always amazed me how much faster a rifle swings and balances better when I bring it 1-1.5" closer than standard doctrine would suggest. It also makes it easier to square up and keep the rifle on my chest instead of my shoulder, which makes it easier to transition to the left than a typical long LOP/bladed stance will allow. Practice enough to find what works and what doesnt for you. I'm in the process of changing my LOP. My new gun was built using the Magpul Enhanced Receiver Extension which measures 7.3 inches in length. Using the gun puts my nose just touching the charge handle. A bit disconcerting during recoil. I have ordered an new MERE that measures 7.8 inches. This should give me a little more leg room (or nose, as it were) when shooting. I'm 6'5" with long extremities. I keep the stock all the way out. I keep my support hand all the way out on the handguard and my arm is still bent. I use the leverage to pull the gun into my shoulder minimizing dot bounce and felt recoil. t also makes it easier to square up and keep the rifle on my chest instead of my shoulder, which makes it easier to transition to the left than a typical long LOP/bladed stance will allow. Please explain why there would ever be a scenario where the stock of the rifle would be on your chest ? My new gun was built using the Magpul Enhanced Receiver Extension which measures 7.3 inches in length. Using the gun puts my nose just toughing the charge handle. A bit disconcerting during recoil. I think you should re think that set up. I don't own an AR platform rifle where my nose isn't at least 2" from the charge handle, with the stock one hole from all the way back. Think about it......................PCC, heads up, non magnified optic, the more you can increase the sight radius on the rifle the more you can see beyond the scope. Not to mention, if you were shooting with a magnified crosshair scope on a 5.56 chambered AR, your nose being on the charge handle means you are mounting the scope on your handguard to get the 3" to 4" of eye relief needed on most scopes out there today. A short compact scope will be about 8" long, any basic 3-9 scope will be 12" long or longer. Do the math, needing 3" minimum of eye relief with a 12" scope says you need to move your head back from the charge handle. Since every single human being ever born and walking upright today is built different, talking dimensions regarding the length of this or that on a specific rifle is pointless. If I haven't convinced you, go grab your favorite home defense shotgun and patronize your local gun club and shoot a round of trap. When you break 5 or 6 targets, or less, ask yourself why. The scenario is that I'm shooting a rifle offhand, and I want the recoil to have minimal effect on sight movement. Not sure where you're going with that last paragraph about the shotguns though. I think the nose touching the charge handle is a tad close, but these guns are small by nature. You're up close and personal when use them anyway. I don't understand the shotgun comparison either. Allow me to clarify............................... I was trying to illustrate the importance of gun fit. Good and proper gun fit equals proper sight picture and comfort as far as mitigating recoil. You are not going to notice it much though in a rifle chambered for a pistol round. Grab a tactical shotgun however, go shoot a round of trap and it will become very evident. Trap basics: hitting a moving target traveling 45mph requires the gun, eyes and body all to work as one unit. If they are not, you will not break the target. Tactical shotguns are short and compact, and for the most part do not fit the average size person to the degree a trap gun would. Granted they are not required to, as their function is not breaking clay targets, but trying to do so would illustrate my point. That was a very long winded way to say your nose should be a few inches behind the charge handle, for many reasons.